We’ve been hard at work improving the deduplication functionality this month. The result is what we think is the best deduping tool available today! First, let me admit that I’ve never really been satisfied with the way myphoner handles duplicates and data scrubbing, and I’ve been wanting to improve the deduping function for a long time. However, the dynamic nature of uploading and configuring lists in myphoner makes working with duplicates a more complex proposition. 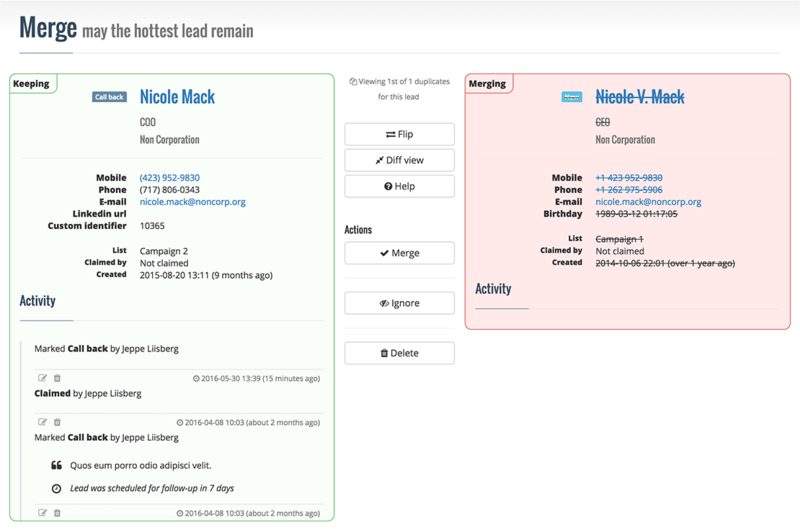 We do not have a fixed template for how lead data are presented, so identifying duplicate leads that are presented slightly differently can be difficult – especially for a computer. As the pressure mounted, I finally decided to take on the challenge and barricaded myself in my office to get the job done. What’s come out of it is something that I am proud of, and something that I do not believe is provided by any competitor. As such, I believe I have created a unique feature of myphoner. So, what is it? What happened in myphoner in May? The manager workflow, providing an overview and an easy way to dedupe many leads quickly. The agent workflow, providing uninterrupted deduplication functionality, while working a queue. Under the hood, it’s a refashioning of the process by which duplicates are detected and registered. Without going into detail, I dare say that the new deduplication features of myphoner are a more reliable and predictable data cleansing route than the old duplicate detection algorithms. The duplicates overview found under Manage Duplicates has changed significantly. The new focus is on resolving as many duplicate issues in as short a time as possible. To do this, we came up with a new view for comparing leads, to make it easier to see what will happen when two leads are merged. To the right of the different view sits the action panel, with which you can decide what action to take regarding the duplicate. As always, the options are: to merge the two leads, to delete the duplicate, or to ignore it (which will retain both leads and will no longer show a duplicate warning in this instance). 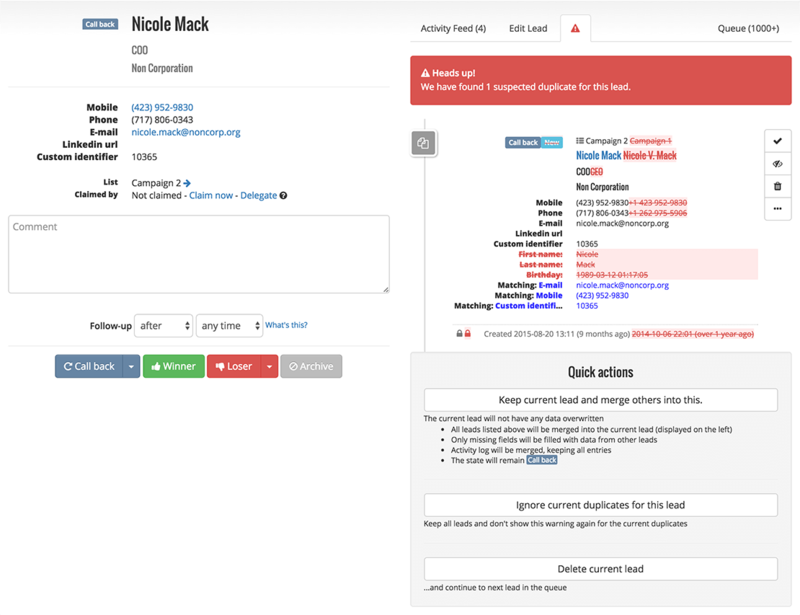 You also get the option to flip the leads: that is, swapping which lead will be kept and which will be merged or deleted (depending on the action you choose). Finally, you can see the comparison in the detailed merge view, where all leads data and the full activity logs for both leads are shown. Everything is handled inline and automatic scrolling makes sure duplicates are loaded up as you go along, so there is no need to change or reload pages, allowing you to focus your energy on deduping your leads and scrubbing your data. The second workflow we wanted to improve was that of the agent. 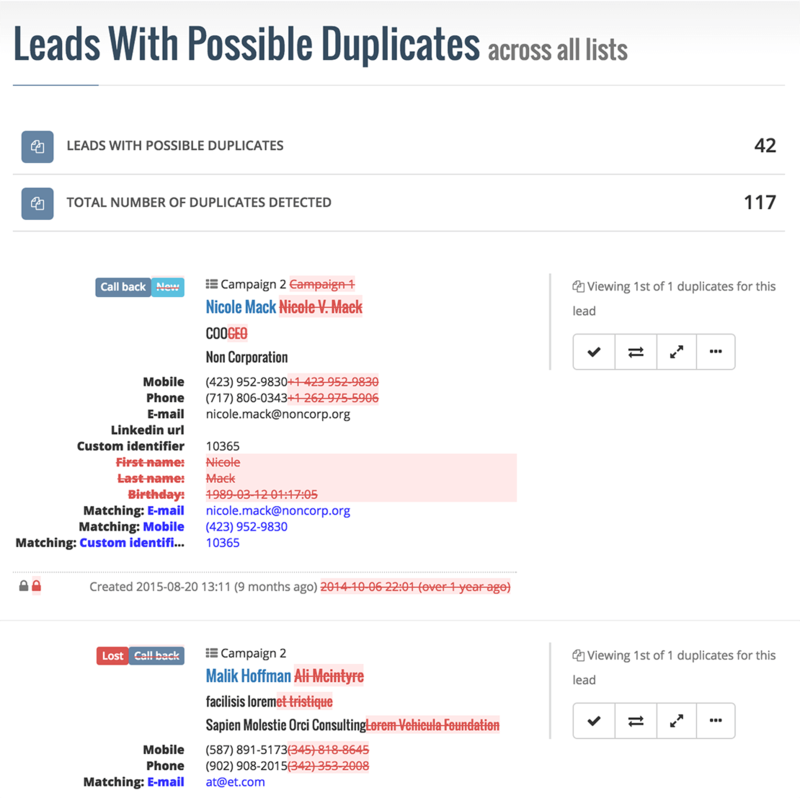 First of all, agents are now able to handle duplicates, as long as they have access to the list of duplicate leads, and no other agent has locked or claimed the duplicate. This is a significant improvement, which allows the team to distribute the workload of deduplicating data and delete duplicate contacts as they go along. The new different view is now the default for duplicates, as on the overview page. Agents can go to the full merge view if need be, and, when they finish deduping, they will be taken back to the queue they came from to continue work with minimum interruption. Miss the old merge view? button. You can switch effortlessly between the extended merge view and the different merge view, and both views offer full deduplication functionality. I believe that these new, improved workflows make deduplication through myphoner even more efficient, and I hope that the users of myphoner will feel the benefit. But it does not stop here – next up: Auto-dedupe!